Keep out of reach of children. Use under adult supervision. Please read all directions on each individual prior to use. The items in this kit are for treating minor cuts and wounds. Get professional help for more serious injuries and medical emergencies. Caution! This kit meets ANSI Z308. 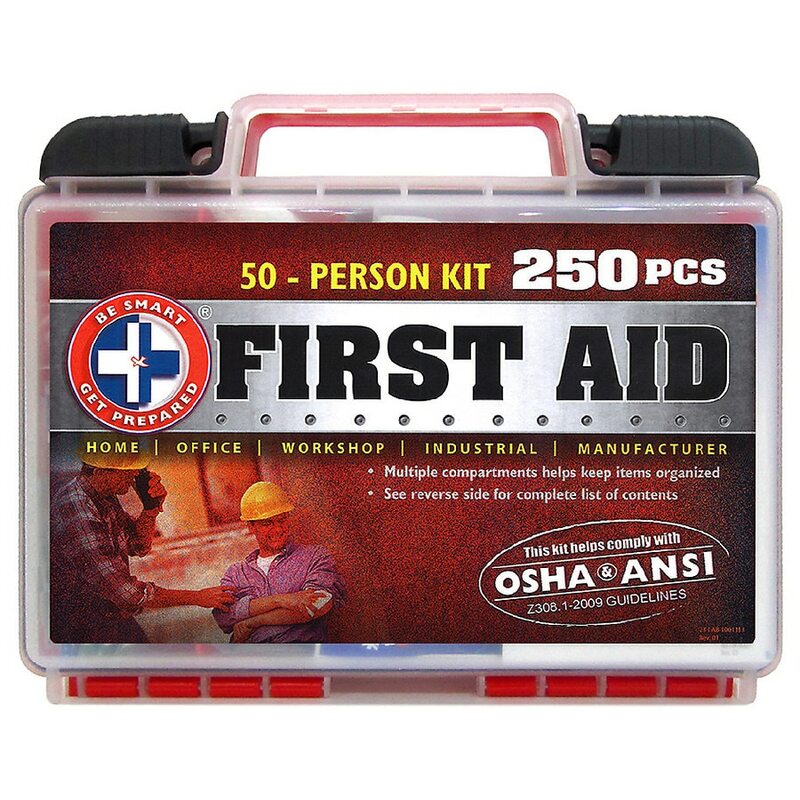 1-2009 only when required minimum fill is maintained with first aid products marked "ANSI/ISEA Z308.1-2009." Required Minimum Fill: (1) First Guide; (1) Absorbent Compress, 4 x 8 in min. ; (16) Adhesive Bandages, 1 x 3 in (2.5 x 7.5 cm); (1) Adhesive Tape 2.5 yd. (2.28 m); (10) Antiseptic Applications, 0.5 g each; (6) Burn Treatment Applications, 0.9 gm each; (4) Sterile Pads 3 x 3 in min. (7.5 x 7.5 cm); (2) Paid Medical Exam Gloves; (1) Triangular Bandage, 40 x 40 x 56 in min. (101 x 101 x 142 cm); (6) Antibiotic Treatment Application, 0.5 gm each. The described kit may be suitable for some businesses. However, the adequacy of the contents for hazards of each work environment should always be evaluated by competent personnel. For a variety of operations, employers may find that additional first aid supplies and kits are needed.